Greg Seroka is on the verge of becoming the third five-time champ in the month of April. Will he do it? Indeed, he will – which means that the games of April 21 and 22 were the only two this month without a 5xer (either eventual or established). Another lock for Greg, and win #5. Congrats, sir! 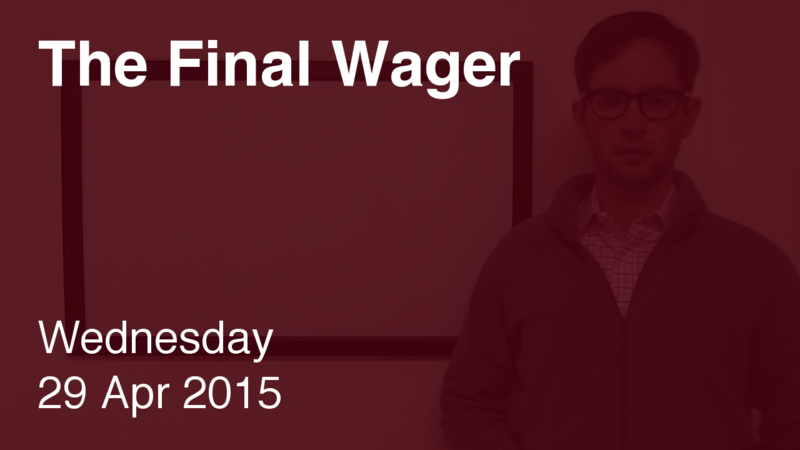 That gives me some more space to discuss Brian’s Penultimate Wager. In the end, we won’t see that last clue due to time constraints, but you’ll notice that if Brian misses this Daily Double – even just $5 – he can’t catch Greg, even with the extra two grand. Therefore, there’s no reason for him to hold back any cash. If Brian hits that actual $4,000 wager, the only way he can win is if he gets Final and Greg misses. The outcome shows why it’s a good idea to be within spitting distance of the leader. Greg’s total is now $133,200, good for third on our leaderboard.